A ten year old girl walked down an old dirt path through the peaks of Zujiuchu Mountains and the beautiful rolling hills near Jasumin Lake. The wind blew softly and pushed the girl’s black hair into her face. Her hair was tangled and messy. There was a dark blue cloak draped upon her shoulders and a brown simple backpack that hung on her back. The cloak had mud on the edges and many worn holes. Her eyes were dark brown and she was wearing a simple tan tunic and brown common trousers. She did have a belt around the pants that had a leather sheath where she kept her silver dagger. On her feet she had simple grey boots that were worn and had a couple of holes. She coughed a few times before she made it to the door of the temple. Finally she had made it. The girl was Salene. She pushed the door expecting it to open. It didn’t. Salene was about to kick the door but then decided against it. Instead she inspected the door and read what the words on it said. The door said -Only I Know The Secret-. Yet, there was something odd about the letter I on the door. It was raised slightly more than the other letters. She pressed on the I of the door with her hand. Hopefully this wasn’t some sort of trap. Suddenly the slab doors moved apart from each other and revealed the entrance. This surprising movement made Salene jump and reach for her knife. However, it didn’t seem as though anything was launching an attack upon her so she kept walking. Inside the hall there were floating sun like orbs but there wasn’t any sort of furniture around. “Hasn’t the owner ever heard of a chair?” Salene muttered sarcastically. The entire hall had images and depictions of moments carved into the walls. They might have been myths and stories of the local area. Or they were just a bunch of artsy stuff that the owner of this place really wanted. Suddenly a little white cat crept into the temple before the doors shut behind it. The cat walked over to Salene and sat down expectantly. Salene noticed the cat and seemed annoyed. The cat merely looked at her then began to lick its paws. Salene sighed and continued walking. The cat followed after her. She walked over to the archway and noticed that there was a large book on a pedestal. Salene stood on her tiptoes and peered over at the book. It had her name down and the time that she had entered. That was a very good way of keeping track of those who entered and left the temple. She continued onwards through the archway until she ended up in a short hallway. Ahead of her was the library that she came for. She did not come here for any gods. Nor any specific book. Or anybody. Not that there was anybody to go to. Bookshelves full of books lined the circular walls and greenish glass ladders for people to get up to the top shelf. There were comfy looking chairs and useful tables. The best part about it was that Salene wouldn’t have to buy a book before reading it or get kicked out since she was a kid all alone. Salene’s tired expression transformed into one of absolute delight. There were books everywhere. This was the most perfect place in existence. In the middle of the room there was a crystal tree dazzling in the light from above. The leaves were silver and instead of regular apples, the tree held golden apples. Which Salene was immediately suspicious of. Were they poison? Golden apples from silver trees did not seem like the type of fruit one should eat. Especially if the tree was surrounded by flowers with gems in them. She coughed haggardly for a few moments. When she was done, Salene noticed another book on a pedestal. This one wasn’t open but it probably was important since it was put in front of a fancy tree. She walked over to the book and when she arrived in front of it. The book opened. Salene jumped back in surprise. Again. Books normally didn’t open on their own. Then again this was a magical library so this should be normal. Hopefully. Maybe she needed to give it a command. “Uhh… show me a book about Canelux History.” Salene said out loud hoping that something would happen. The book flipped to a different page and Salene scanned the pages to find a book that might give her all the information she wanted. A book titled The Complete History of the Canelux Continent that is Known. The title was very lengthy but hopefully it would actually hold all the information that Salene would need to know. There was a thin strand of magic attached to the title on the page. Salene took it and followed the strand until she made it to where the book was. The book wasn’t too far from where the pedestal was so Salene was able to return to the pedestal to find another book. She kept the book she had underneath her arm. From then one, she went searching for all kinds of books. There were history books about Parvpora and Itjivut, books about alchemy, books about medicine and natural remedies, books about magic, books about economy, books about different types of government, books about the importance of art in society, books about astrology, books about the science of nature, books about mathematics and even some survival guides. Salene had at least one of all of the listed types in a pile in her arms. She walked carefully over to the couch trying not to drop any of them. Salene made it safely over to the couch and placed all the books on the table. But there was something missing. Something that she had forgotten about. Her eyes widened with realization. Of course! She had forgotten to get a book that covered battle strategies. Salene already knew some stuff about battle strategy but there was always more to know. She sniffled for a bit then walked over to the magic book in front of the tree. Once she found a title she liked, she followed the strand of magic all the way over to a magical looking glass staircase. Salene had been lucky so far and most of her genres were generic enough to avoid having to go a floor up. The strand went up that staircase so the girl followed after it. Her boots were still a little wet from walking in dewey grasses outside. And she was walking on glass now. It didn’t take long before she slipped on the staircase. Luckily, she was fast enough to catch herself using one of the rails. “Stupid boots.” Salene said bitterly. Then she sat down on one of the stairs and took off her boots. She didn’t have any socks so her blistered feet would have to be out in the open. Salene didn’t mind much. She tied the boots together with one of the laces then threw her boots over to where she had been sitting. Salene didn’t check to see if it would hit anybody. But nobody was shouting or screaming in pain, so she assumed that it didn’t hit anyone. Salene continued up the stairs wearing no slippery shoes now and made it to the second level safely. The book she had been looking for was on a shelf not too far away. Once she had it, she began making her way back downstairs. Nobody had taken any of her books from the pile she had made on the table. So Salene sat down on the couch and took off her backpack. After digging around in it for a while she pulled out some pastel blue magical glasses. Somebody had given that to her after she did a job for that person. It was the first object that Salene had ever earned. But more importantly, it was useful for cases like these. She also got out her second journal, a quill, and ink. There was a strategy in her mind in order to allow her to be able to read all of these books. Her hand flipped the thick journal to its tenth page where the words - Canelux History- titled the page. She put on her magical pastel blue glasses. Then she picked up the book about canelux history and started flipping through it’s pages. These special glasses allowed her to flip rapidly through the pages and yet still pick up all the information from each page. There was a drawback to the glasses. Whenever she took a long nap she would forget all of the information she had learned with the glasses. However, she had a plan to get around that. After she was done flipping through the book she organized each chapter’s information into some notes in her journal. The information was still fresh in her mind so she was able to summarize what each chapter was about. Salene wrote down the cause and effects for the historical events that were mentioned in the book along with the general time period that it had taken place in. There were some stuff that she already knew so she didn’t have to write everything down but anything she didn’t know that was important, she wrote it down. Her journal was large enough to hold all of this information. Suddenly, the white cat from earlier jumped onto the couch and made its way to Salene. “Gooooo!” Salene whined not really wanting the cat around. She gently pushed the white cat in the opposite direction. Instead of leaving, the cat simply rubbed its head on Salene’s hand. Salene puffed out her cheeks in anger that the feline was still there. The anger didn’t last long though because the girl started petting the kitty’s soft fur. She couldn’t resist the soft fur or how adorable the creature was. Even though she would deny that she liked cute creatures if anybody asked. The cat made its way onto her lap and curled up there. “You know I’m not going to be sorry if I move and you become uncomfortable.” Salene warned the cat. The feline did not seem to care. She continued on with her notes. Despite being a child, her handwriting was clean and clear. It was almost perfect. Her I’s were a little inconsistent but everything else was fine. Salene coughed haggardly again but moved her head away from the books and her work. She moved onto the next book. Then she moved onto the next. The magical lenses made reading much easier and faster. Her note taking was much slower than the reading was but she was able to make good notes and fill her journal with information. A smile was on her lips. She had a hunger for all this knowledge. It was a strange desire that never seemed to be filled. There was always more to know and that’s exactly what she wanted. A piece of bread suddenly was given to her by an invisible hand. Salene took the piece of bread with her mouth and didn’t stop writing. She knew that her own hand would feel pain and cramped after writing so much. That was why she switched hands occasionally to give the other hand a rest. The bread was good and much better than most of the meals that she was able to catch. She chewed the bread but just ate it up like a bird. Not using her hands and all. Time passed by and she was still there writing and reading all those books she had collected earlier. Most of the time was taken up by the writing since the reading was extremely fast. Salene was writing as if she was on a mission. Her eyes were filled with furious passion and her hand write faster and faster the longer she was at it. Yet she was somehow able to keep everything neat and tidy in her notes. This was an opportunity she would not let pass. Salene had a seemingly endless library at her feet. Before she was unable to get her hands on one book. Let alone all of these. Money was always an issue. Salene was too young to get a steady nice paying job. Even if she was older, it would be difficult. She didn’t have any money most of the time, she didn’t look rich, she wasn’t a strong warrior or had any particular skill, and her attitude did not make her a reliable candidate for most jobs. She did get money by selling the things she hunted or what she was able to find that she didn’t want. But that was unreliable and still didn’t give her enough to be pulled out of the poverty she found herself in. Still, she was able to afford more than many others. Salene was also able to travel and be on her own. When she had heard about the temple library she headed straight here. And here she was. Salene was a kid but her mind was so much older. Her emotional maturity was the same as a kid’s but her intelligence was much higher before she even made it to the library. Then again, was it proper to call it her intelligence if it was technically somebody else’s once? Salene focused her thoughts back to her books and notes. So young this one was. About the age of some of his youngest children, perhaps even a touch younger. And to be reading so voraciously, he would have thought her to be a word dragon. His interest piqued he stood and watched for what felt like an age as she read through book after book, and wrote pages upon pages of notes. Impressive it was to see someone so young to be so fluently ambidextrous. He didn't know of many who could do that. He looked at the little milk white kitten that vied for her attention. With a gentle wave, a small saucer of cream appeared on the table, but out of reach of the books so that it would not splash or interfere with the study. Tar Eisalae appeared beside the kitten, barely bigger than a house cat, and lightly began licking the little kitten behind the ears to keep him clean of the cream. Drae noticed what the young girl might not have… the slowly growing growl in her stomach. He smirked a moment before he came and sat unnoticed beside her, a loaf of bread from the larders materializing in is hand. Carefully, he angled the bread out in front of her mouth, and without missing a beat she began nibbling upon it, pecking at it periodically like a bird. He held in a chuckle, not wanting to disturb her study, but he honestly wondered how long she could keep this up. Those magical glasses would eventually put a strain on her eyes and her mind. Finally, she took a pause from her studying. Looking to her left, the little girl could see the pile of books that she had been able to get through. She hadn't gotten through all the books. Just as she was about to continue, the child began to cough haggardly. Several coughs escaped her lips. Other people in the library were looking over at her to see if she was choking. The little girl gave them a thumbs up and stopped coughing. It was cold. And it was warm. Salene packed up all of her stuff and took off her glasses. She'd pushed herself already. Her eyes were tired as was her mind. The glasses were off so she couldn't remember what she had been reading. But with the notes, Salene would be able to study off of them and get the basics down. The white kitty had finished its meal of cream. Salene noticed that there was another cat, slightly larger than a house cat, next to her kitten. "Oh. Another cat." She commented out loud, "Well kitten, looks like you have a friend. Mr New Cat, you can come with us if you like. We will probably be here for a while." All her stuff was together so she began to walk over to one of the bookshelves. It was an endless maze of bookshelves. She continued walking forwards until she figured that the people in the main part of the library would be unable to hear her. The white kitten had followed her. Salene walked into an area that was between two bookshelves. Sitting down, she took out a blanket from her backpack and curled up in it. Then she took off her backpack to make herself more comfortable. After coughing a couple times, she looked over to her white kitten, noticing that it didn't have a comfortable place to sleep. Searching through her stuff, she found a goat hide that she had hunted and skinned herself. The child placed the hide on the ground and the kitten curled up on the hide. "Guess I can't use you as a pillow." 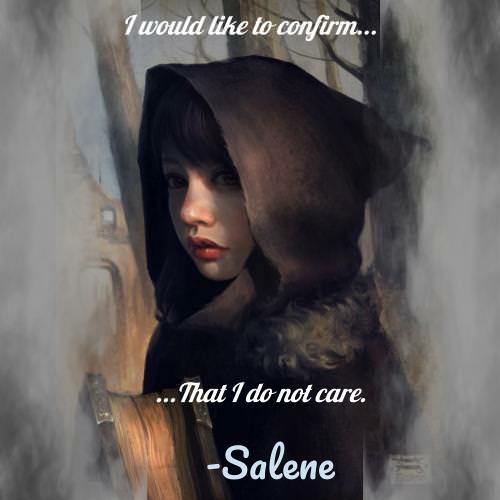 Salene said with sarcasm practically dripping from her voice. Now that they were close to sleeping, there was a tradition that the child had to continue. Find the sweet candy." She sang softly to the white kitten. The child set her head down on the hide next to the white kitten and curled around it to keep the kitten as warm as possible. It was as if the rest of the world and even the library had faded away. Keeping the kitten warm was her only concern. The kitten had closed its eyes and had gone off to sleep. It was lightly purring. Either due to the child's warmth or because it was a cat. "Can't imagine why you are sleepy." Salene said sarcastically, "Goodnight." Finally Salene closed her own eyes. It was hard getting to sleep. The ground was rock hard. She felt cold and warm at the same time. Somehow. Her head was pounding and she could feel her throat tickle. 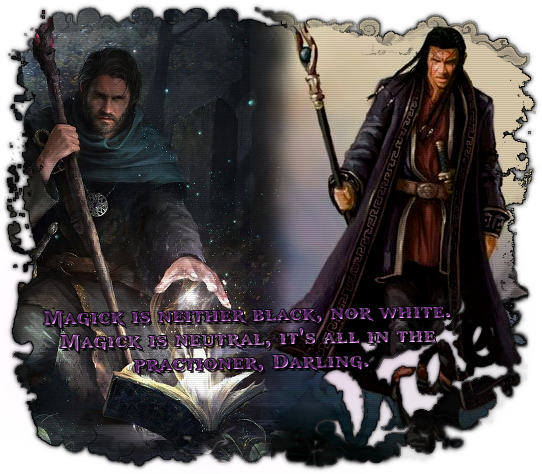 Drae and Tar Eisalae regarded each other as the girl collected her stuff, completely unaware that the Master of the Library had been there at her side. The Keeper motioned with his head, and the celestial-pelted cat jumped down off the table and followed after the girl and her kitten. Tar Eisalae followed Salene through the bookshelves and found a perch nearby to watch her as she bedded down on a goat skin to sleep. Drae waved a hand an the books returned to their appropriate shelves. He did some rounds to make sure the other visitors to the Library were settled in all right. "Master… I think you should come here…"
Drae felt Tar Eisalae's words in his soul, more than heard them and he stopped what he was doing and followed the cat's call through the shelves to where the girl had fallen asleep on the floor with her kitten. "I think she is sick…"
"I think you are right," Drae replied as he came over and stooped low over the young girl. He delicately placed the back of his hand to her forehead. He tsked. "Silly child…" he muttered. "Tar, grab the kitten," he said as he carefully hoisted the girl up in his arms. Tar Eisalae hopped down from its perch and picked up the kitten by the scruff. Drae and Tar carried the duo into the rooms set aside specifically for those who were visiting the shrine. Drae found an unoccupied bunk and carefully put the girl down on the soft mattress. Tar Eisalae brought the kitten up onto the cot and put it down next to Salene. "Tar, Angela's fever tonic and eucalyptus salve please…"